The Computational Science Initiative is building its staff, capabilities, and programs in this emerging research area expected to revolutionize science and other fields. Brookhaven Lab’s Computational Science Initiative recently formed a new Quantum Computing Group as one of the many ways it’s expanding its efforts in quantum information science. 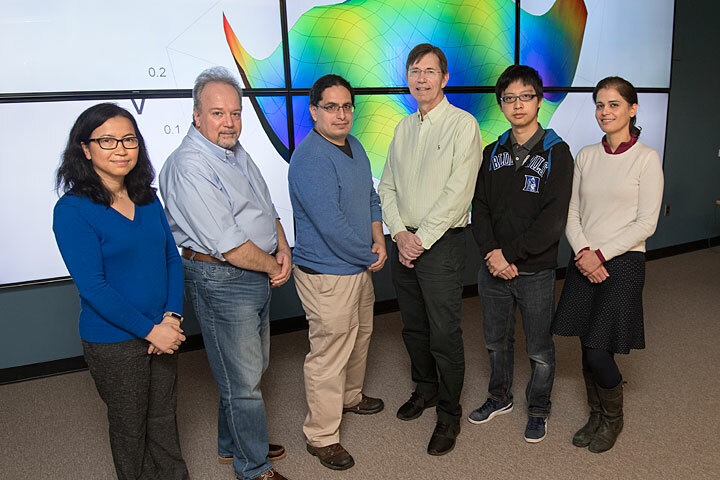 The group members are (left to right) Meifeng Lin, Dimitrios Katramatos, Eden Figueroa, Michael McGuigan, Yao-Lung (Leo) Fang, and Layla Hormozi. Lin and Hormozi are co-leading the group. An emerging and exciting research field known as quantum information science (QIS) is ramping up in the Computational Science Initiative (CSI) at the U.S. Department of Energy’s (DOE) Brookhaven National Laboratory. The computers we use today store and process information in the form of binary digits (bits) that encode a value of zero or one. The values represent two different states, such as off or on, true or false, and yes or no. A schematic illustrating the difference between a bit (left) and qubit (right). A bit can be at either of the two poles of the imaginary sphere, while a qubit can be at any point within the volume of the sphere. Credit: IBM. By contrast, quantum computers use quantum bits, or qubits, that can exist as a zero and one at the same time. This newer form of computing takes advantage of the strange way that matter behaves at atomic and subatomic scales. In this quantum world, atoms and subatomic particles appear to exist in multiple states or places at the same time (quantum superposition) and can correlate their behavior across large distances (quantum entanglement). Because of these quantum mechanical phenomena, quantum computers can store much more information, perform calculations significantly faster, and use less energy than classical computers. At Brookhaven Lab, CSI staff are evaluating and designing QIS systems and developing the system-level support and algorithms needed to fully exploit the new QIS architectures. 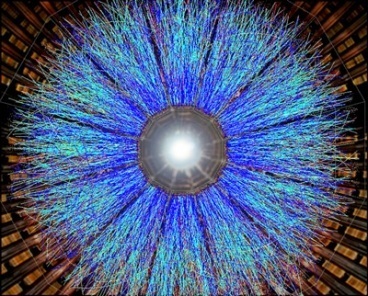 “CSI has access to several online test systems, including the IBM Q quantum computer, and is actively using these systems for its research,” said Kleese van Dam. Launched in 2016, IBM Q is a cloud platform that provides companies, universities, and research labs around the world with the ability to perform quantum computations online without having direct access to a quantum computer. Credit: IBM. In addition, CSI has been building relationships with leading experts in the field from various institutions, including the Massachusetts Institute of Technology (MIT), Princeton University, Harvard University, Tufts University, Stony Brook University, and the University of Toronto. Several of these experts now have joint appointments with Brookhaven, including MIT mechanical engineering and physics professor Seth Lloyd and Tufts associate physics professor Peter Love. In house, CSI is building its QIS expertise through educating existing staff, hiring new personnel, and hosting students, such as those participating in DOE’s Computational Science Graduate Fellowship. CSI researchers and external QIS experts are currently carrying out several joint QIS projects. CSI computational scientists Shinjae Yoo and Layla Hormozi—who is co-leading CSI’s new Quantum Computing Group with computational scientist Meifeng Lin—and collaborators from Carnegie Mellon University, MIT, and Stony Brook are evaluating existing QIS architectures for state-of-the-art machine learning algorithms. In particular, they are identifying issues related to the programmability and performance of algorithms operating on QIS systems. Currently, the team is investigating strategies to overcome slow data loading speeds and to effectively encode data. A video describing why we need quantum computers and how the Q quantum computer works. Credit: IBM. Another team—including CSI computational scientist Michael McGuigan and collaborators from Boston University, Microsoft, MIT, Michigan State, Syracuse University, University of California, Santa Barbara, and University of Iowa (lead)—is developing the building blocks of quantum computing to solve basic questions in high-energy physics (HEP) and the early universe. In particular, the team is studying ways to efficiently map quantum field theories of the strong interactions—mathematical frameworks that describe the interactions between subatomic particles—to quantum computing hardware. Proposed structure of the oxygen-evolving, or water-splitting, center of Photosystem II, a protein complex that executes the initial photosynthesis reaction. 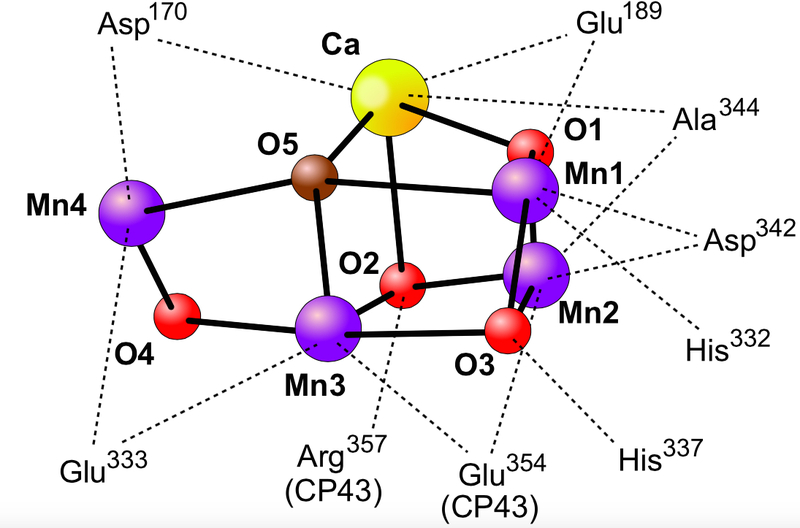 The center contains a cluster of manganese (Mn) ions, a calcium (Ca) ion, oxygen (O) atoms, and coordinating amino acids. Through a separate collaboration, Brookhaven Lab and Harvard University are developing quantum-based models of biomimetic photosynthesis. Chemical processes that replicate and optimize photosynthesis—the process by which plants convert solar energy into chemical energy—could be used to produce clean and sustainable fuels and other chemicals. CSI has also created the Northeast Quantum Systems Center (NEQsys), a partnership between Harvard, MIT, Princeton, Raytheon, Stony Brook, University of Toronto, Tufts, and Yale. By leveraging the wealth of quantum expertise at leading universities and in industry, this collaboration seeks to impact a broad range of areas—for example, theoretical and experimental materials science and condensed matter physics, devices and system software, and algorithms and computational applications.